A southern English species with records west to south Devon and the south Wales coast and north to Worcester and Suffolk, older records exist from further north; north Norfolk and Lincoln. Records are generally sparse with most reported from three regions: the Severn valley, Kent and Essex around the Thames estuary and Oxfordshire (Luff, 1998). Quoted as rare (Luff, 2007) and, from its distribution obviously local, the species may nonetheless be common where found (Lindroth, 1974). The adults inhabit damp situations on heavy soils, among moss, leaf litter, haystack refuse and among vegetation generally. They occur throughout the Watford area although our records are sparse and sporadic; from the Radlett road open space we have recorded them from under the bark of decaying willow logs and from under a small area of dead bark on an otherwise healthy Lombardy Poplar (Populus nigra var italica), both records from February 2007. During February, March and April 2007 several were extracted from grass tussock samples taken from around the pond in Cassiobury park. Adults are quoted from March to October and thought to be spring breeders (Luff, ibid). 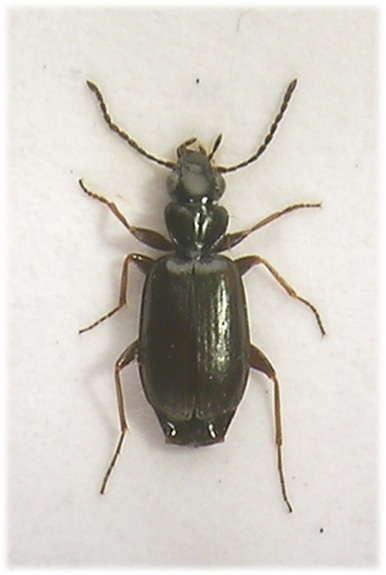 When first recording these small carabids many may seem very similar, mostly because of their size and dark colouration, but with a little experience members of Syntomus may be recognised in the field with a X10 lens. 3.0-3.8mm. (Luff, 2007). 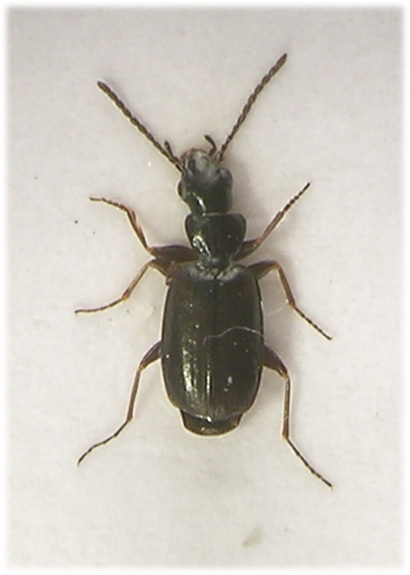 A small, dark and rather flat ground beetle with proportionally large head and small pronotum. 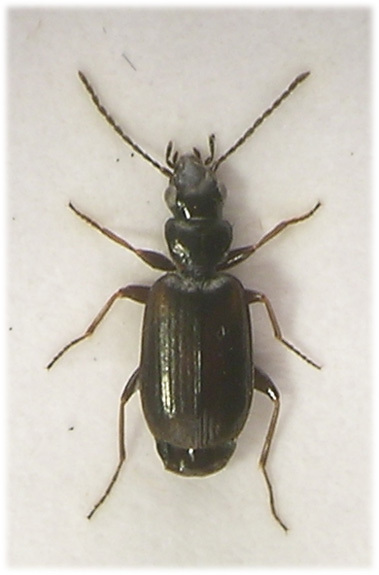 Forebody black, sometimes with a faint metallic reflection, elytra lighter. Head with strong, dense reticulate microsculpture, two setiferous pores beside large, prominent eyes and another inside antennal insertions. 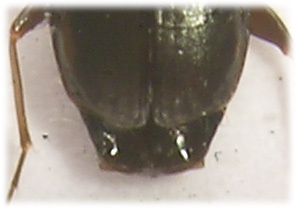 Maxillary palpi black or dark rufinistic, pubescent from fourth segment. Pronotum widest behind rounded front angles and strongly contracted to very obtuse front angles whiched are displaced in front of base. Strongly bordered, with a long, stout seta at widest point and another inside hind angles. Usually with a longitudinal impression from base to oblique impressions behind anterior margins, forming a 'Y', these vary in strength. Weakly impressed inside hind angles but without distinct basal fovea. Microsculpture as strong as that on head or nearly so, this varies. Elytra dark brown with pale shoulder macula and sometimes another before apex (Lindroth, ibid), these may be indistinct but strong light at X40 will usually make these obvious. Sides strongly bordered, widest behind middle or somewhat parallel sided, obliquely truncate and weakly sinuate at apex leaving terminal abdominal segment(s) obvious from above. Entire surface strongly microsculptured, as head, striae fine but obvious, outer striae represented by longitudinal series of punctures. Dorsal punctures fine, not foveate. With a strong setiferous puncture either side of apex of scutellum. Legs brown with darker femora. Protibiae strongly notched inside before apex. Tarsi without any bilobed segments, claws denticulate.